WEST VILLAGE — You've heard of drunk dialing and drunk Facebooking, but drunk puppy buying? "I feel like they always come in drunk," said Fernanda Moritz, the manager of Le Petite Puppy at 18 Christopher St. which has implemented a policy against letting customers buy — or even hold — animals if they've been drinking. "They come from there and say 'let's stop by to see the puppies,'" said Moritz. Amazingly the store, which has supplied puppies to celebrities including Sarah Jessica Parker and Hugh Jackman, isn't the only one in the neighborhood forced to implement the ban. 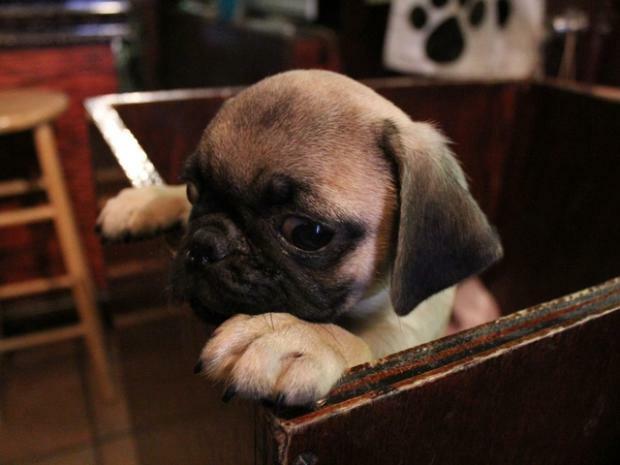 Christopher Street's Citipups also forbids intoxicated customers from purchasing puppies. Moritz recalled selling a Chihuahua some years ago to a woman she thought might have been drunk, only to have the dog returned the next day — in a near-dead state. "We took it to the vet and he found five pills in the dog's stomach," she said. "It almost overdosed." The Chihuahua's stomach was pumped, and it survived. Now Moritz and her staff are always on the lookout for intoxicated customers and won't even let those they suspect are drunk hold the puppies to keep them from being dropped. Moritz says the situation is an occupational hazard of working on a strip well known for bars and boozy brunches. The adorable sight of furry faces in the window and the effects of alcohol can be a bad combination, Moritz said. Further west on Christopher Street, Leandro Jacoby, the 28-year-old manager of Citipups also had to make judgment calls on the sobriety of some of his customers. Citipups — located next to the Stonewall Inn and Duplex at 45 Christopher St. — has come up with a creative way to test whether a customer is serious about the purchase. "We have to tell them to come back the next day and most of the time they never come back," Jacoby said. "Most of the time it happens around holidays — St. Patrick's Day or Gay Pride," he added. Four-years ago on St. Patrick's Day, a couple came into the store and spent $3,500 on an English Bull Dog and a Miniature Pinscher. The morning after, the couple returned to the store, apologized to Jacoby, and gave the dogs back. "They were just having fun," said Jacoby. Even though turning down drunken customers might seem bad for business, Moritz and Jacoby both say they'd prefer to lose the sale. "We make sure they can take care of the dog. We make sure they go to a good home," Jacoby said.